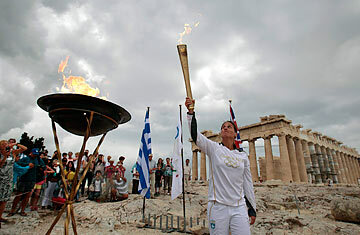 Greek athlete Niki Liosi lights her Olympic torch from a cauldron with the Olympic Flame atop the Athens Acropolis, May 17, 2012. The rain didn't bother Katerina Papamichail. Standing on the marble steps of the Panathenaic Stadium in Athens, the site of the first modern Olympics in 1896, she and a friend huddled beneath an umbrella on Thursday to watch the ceremonial handing over of the Olympic flame to the London 2012 organizers. Hundreds of other Greeks did the same, some wearing T-shirts from the 2004 Athens Games to remind them of better times. "We've forgotten what it feels like to feel good," says Papamichail, an ebullient businesswoman in her 50s. "Well, I'm not going to forget. The rest of the world can treat us like paupers, but I know we're not." Papamichail clapped when the Greek honor guard  soldiers dressed in the skirt-like fustanallas  marched in. She screamed like a teenage girl  along with the rest of the crowd  when she saw soccer star David Beckham, who's on the London 2012 committee. And she choked up when Greek tenor Mario Frangoulis belted out a soaring rendition of the Greek national anthem as rain soaked his elegant suit. The flame had been lit in Olympia a week earlier. More than 5,000 people packed into the tiny town in southern Greece to watch ceremonial priestesses dance on the grassy hills above the ancient stadium where the Olympics were first held in 776 B.C. Elementary school teacher Sophia Mermela had driven two hours from her home in Patras to watch the torch-lighting ceremony. A tiny woman in Jackie-O sunglasses, she held a blue-and-white Greek flag above her head. "I'm disappointed more people didn't bring flags today," she sighed. "I don't want the visitors to think this crisis has beaten the pride out of us." An actress playing the high priestess lit the flame in the Temple of Hera with the help of a parabolic mirror  and "maybe a little assistance from the sun god Apollo," Mermela said, smiling. Olympia lives off tourism, which has tanked since the debt crisis began in 2010. Corinna Spilioupoulou, a German who runs a struggling photography studio with her Greek husband, has lived in the town for more than 20 years. She sees more empty storefronts on Olympia's main street these days and hears the desperation of her friends when they meet at local cafes. "If my husband could speak German, I'd move back home," she says. She points to her two teenaged sons, both riding with friends on small dirt bikes. "They would be devastated leaving here. I would be, too, because Olympia is my home. But I am worried we are not going to make it." The flame left Olympia with Spyros Gianniotis, a 32-year-old swimmer who's competed for Greece at every Olympics since 2000. Born in Liverpool to an English mother and Greek father, the lean, freckled Gianniotis grew up swimming in the open sea surrounding the Ionian island of Corfu. "I can't really put into words how wonderful it feels to swim in that unpredictable sea," he says. "You have to focus and have faith in yourself to master those waves and win. Greeks can do this better than anyone else. But we have to have faith in ourselves." The journey of the torch across Greece played out this week against the backdrop of a political drama in the wake of elections on May 6. The two parties that had dominated Greek politics for nearly four decades  the conservative New Democracy and the Socialist PASOK party  were punished by anti-austerity voters in the polls, losing huge numbers of seats in Parliament. The Coalition of the Radical Left, known as Syriza, finished in a strong second, dramatically reshaping Greece's political landscape. But no party won enough votes to form a government, so in the seven days the Olympic flame traversed the country, politicians tried in vain to form a government. Syriza nixed nearly all of the coalition plans, saying it didn't want to form a government with anyone who supported the memorandum of agreement between Greece and international lenders. Those lenders  the European Union, the European Central Bank and the International Monetary Fund  have given Greece billions in bailout loans, but the money has come in exchange for painful austerity measures that have devastated the economy. A deep recession is now in its fifth year, the unemployment rate has reached 21 percent and tens of thousands of businesses have closed. "The euro zone is not in danger because of Greek resistance," Alexis Tsipras, the brash, young leader of Syriza, told leftist deputies on Thursday, "but because of the bankrupt policies of the memorandum and of yesterday's politicians." Talks on forming a coalition government broke down earlier this week. President Karolos Papoulias called for new elections, which are expected to be held June 17, and named a caretaker government led by Panagiotis Pikramenos, a senior judge whose last name, appropriately enough, means "embittered." Greek Orthodox priests in white and black robes also swore in the newly elected parliament  but just for a day, since it had to be dissolved by law to pave the way for new elections. Among those sworn in were 21 deputies from Golden Dawn, an extreme far-right party that wants to "clean" Greece of immigrants and cancel the austerity measures that came with the bailout loans. Though Golden Dawn strongly rejects the neo-Nazi label, its leader, Nikolaos Michaloliakos, gives the Nazi salute at meetings and says the Holocaust is a lie. Public opinion polls show that Golden Dawn will likely meet the 3 percent threshold to also win parliamentary seats in the next election. But the leading party in the vote will most likely be Syriza, the leftists who say austerity has produced a vicious cycle of deflation and is destroying not only Greece, but the entire euro zone. "There is a threat to the euro but it's not Syriza or people resisting cuts, it's the policies pursued by the major European countries," says economist Euclid Tsakalotos, a member of Syriza. "It's not very easy for Europe, in the long run, to signal that European people can vote for whatever they want as long as it's what [German Finance Minister Wolfgang] Schauble wants. That isn't viable. There are issues of justice and democracy here." The idea of a more democratic Europe resonated with Katerina Papamichail back at the torch-handover ceremony at Panathenaic Stadium. Papamichail agrees that Greeks need to stand up to German politicians who, she says, have treated her country with disdain and disrespect. She watched the British dignitaries leave with the Olympic torch and pondered life without the euro. "They have the pound, and I suppose we could have the drachma again," she says. "But, no, I won't accept that. We deserve the euro as much as Germany. I won't let them force us out."